I have to credit my lovely agent for this post. We were trading stories on what we’ve learned to make from scratch (it was a fascinating conversation. between us we have learned to make everything from yogurt to paneer to jam. it had to have been one of my favorite food chats). Anyway, we got to talking about babies, toddlers and treats. As in candy treats. What, you say? Candy for babies? Ok, before you stop reading my blog (all, like, 8 of you, that is) let me explain. We as parents, especially of young babies and toddlers, are always striving to fill up their tummies with good things, like fruits, veggies and other (oftentimes organic) yummies. But what about when your little one learns the art of getting a treat? Or wanting a piece of candy? Or simply wanting something sweet? It’s a challenge trying to find healthy ways to satisfy that sweet craving as most little ones have no limit when it comes to sweets. Yes it is! Natural in the true sense of the word too. It hadn’t occurred to me that I give my little Kirina “candy-like” treats all the time, especially now that she is dealing with potty training and the like. She has had homemade jam on a spoon as a treat. Frozen bananas drizzled with cardamom flavored chocolate. Strawberries dipped in vanilla sugar. Sure, there’s sugar in these treats, but there’s no corn syrup or artificial of dyes. Just the colors and tastes of the summer. And best of all Kirina is getting to taste nature at it’s ripest–the raspberry jam was made with fruit picked only hours before. The bananas were made with a drizzle of melted chocolate chips mixed with cardamom powder, cut into small chunks and frozen (making it hard like candy). 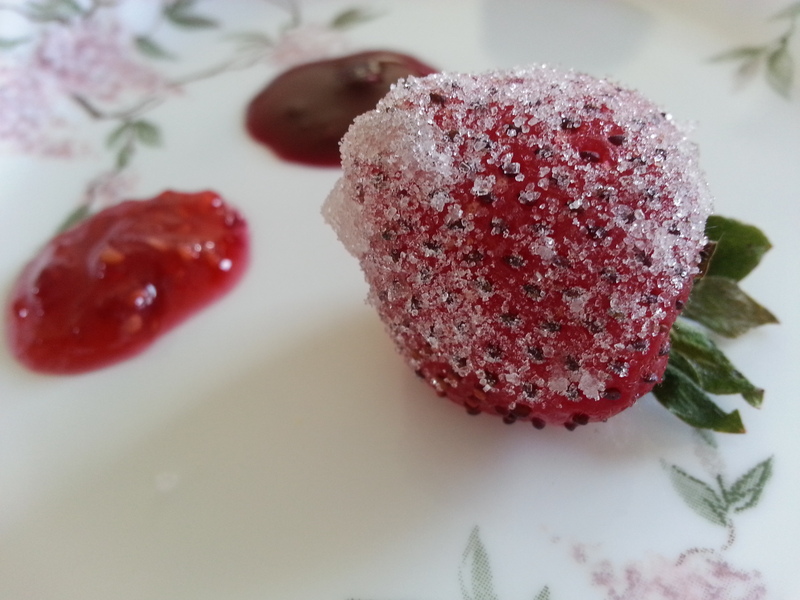 Even the strawberries were fresh from the farm (the vanilla sugar was made with a drop or two of extract) but made to look like candy. Vanilla sugared strawberry; raspberry and cherry jam drops in the background. 1. 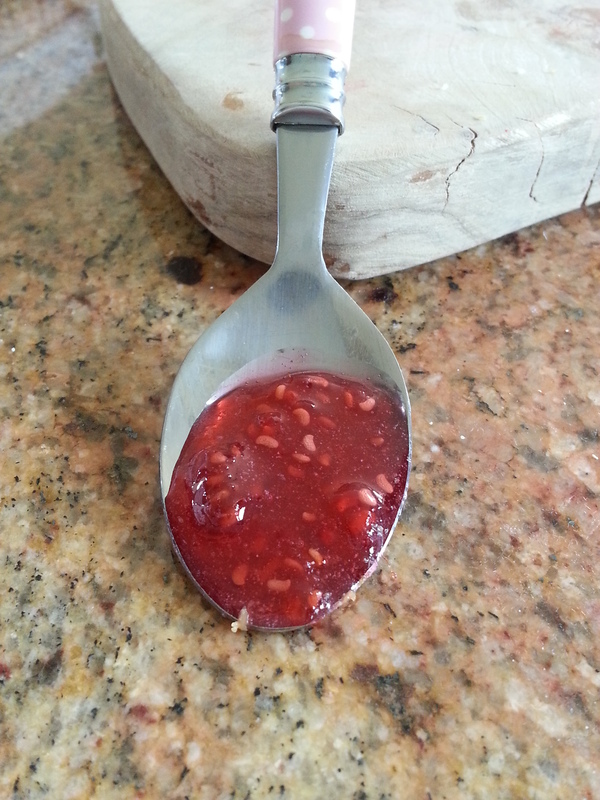 A spoonful of jam, preferably homemade. Make small circles on a plate or other fun drizzles. Let baby play and eat. 3. Frozen yogurt dibs (freeze organic greek yogurt mixed with jam of your choice into ice cube trays. cut into teeny pieces for baby. make sure baby is old enough for this…ask your doc about yogurt). 4. Curried chocolate chips (melt together a pinch of curry powder with 15 or so chocolate chips in the microwave. Use a spoon to drip melted chocolate onto a cold plate, to make your own little chips. when they cool you will have flavored candy). Instant gourmet chocolate! 5. Vanilla sugar strawberries (or peaches or raspberries) (add 1-2 drops vanilla extract, preferably the alcohol-free kind, to 1/4 cup of sugar. dip fresh strawberries into mixture and enjoy. 6. Spice up your sugar! Flavor your sugar with different extracts, say almond or aniseed. Or crush some mint leaves and mix with sugar for natural peppermint (remove leaf when finished, flavor will perfume the sugar). Other herbs to try? Basil sugar (goes well with strawberries). Cardamom sugar (pairs well with cantaloupe or banana). From Kirina’s highchair to yours, bon appetit!